Not all consumers will be willing to learn about Smart Meters, analyze utility bills, pay for the upgrades or even care. The story will be a particularly hard sell during tough economic times. Developing a Smart Grid includes technical items like meters, technology, but the real goal is behavior change. My Dynamic Pricing post showed how financial motivation will be used to engage customers to change their energy use behavior. However, the behavior change issue is more deeply rooted. It is very hard to drive behavior change and very few industries have done this. The technology industry usually lets people do what they were doing already in a new way. In addition, low cost electricity at any time consumers want to use it is seen as a core right. Cheap anytime electricity is seen as an entitlement, the customer feels they own the electrons in their home. Changing these attitudes and competing for customers’ attention and how they use their time will require a concerted effort. As an industry, we have kept the magic behind the "wall switch" to ourselves. Therefore in order to educate our customers on the value proposition of smart grid, do we first have to educate them on some of that “magic”? Will they care? The average American knows very little about personal energy consumption and energy savings. According to a survey published in The Proceedings of the National Academy of Sciences, Americans overestimate the energy savings of actions like turning off lights, and riding public transportation, but underestimate the energy consumption of other things like using central air conditioning. A key to guiding people to make better decisions about their own energy usage, will be establishing the knowledge about how energy flows work at an earlier age. The power industry has seen little innovation over the past century, which is why greentech entrepreneurs in Silicon Valley are so eager to build companies in this industry. But another result is that utility consumers are used to a routine, never-changing relationship with the utility, and aren’t used to any type of change, period. Curtailment - The right of a transmission provider to interrupt all or part of a transmission service due to constraints that reduce the capability of the transmission network to provide that service. If customers are curtailed inconveniently, with a high frequency of occurrence, there will be tremendous push-back. Less inconvenient demand management facilitated by the smart grid is of critical importance. PCT – Programmable Communicating Thermostats - There was a large California citizens backlash over rumors of that PCT would be required in building codes and the utilities would control air conditioning use without the consumer’s knowledge. Even though these rumors weren’t true and the building code made economic sense, the building code change was defeated. In April 2010, the California PUC ruled that utilities can add gains from behavior change programs to their energy efficiency goals. These programs attempt to reduce power consumption by changing the behavior of consumers. A Smart Grid is a key enabler in communicating peak prices to consumers; and integrating smart appliances, with the goal of changing consumer behavior. Seeing the consequences of actions – or not is critical to successful behavior change. Successful smart grid implementation requires that electricity customers—residential, commercial, industrial, and institutional—have the information and the tools needed to participate in the market. Clear and consistent information, e.g., when the grid experiences peak demand, and effective tools, e.g., switches and smart appliances, enables informed and active customer participation in the smart grid. Service providers and others need to be encouraged to develop interoperable devices, programs, and other services on a timely basis to enable customers to participate in smart grid programs. The Smart Grid is competing for customer attention and follow-through. It needs to be free and simple. Consumers may have no idea what to do with too many confusing choices. They may think their impact is so small, it doesn’t matter what they do. Money can be a motivator, but only big energy costs motivate change. People may think of themselves as frugal, but utility bills are invisible – unless there’s a big spike. Still, savings can feel like a little reward – EnergyStar rebate feels good. Customers need to see the “value proposition” for participating in the smart grid, and that their utility bills will be reduced. Levels of knowledge and quality of information will differ by region, utility, and delivery point on the grid; understanding these regional and local differences will impact the manner in which customers participate in smart grid decisions. Regulators, legislators, and others need to be educated on the opportunities provided by the smart grid, as well as the costs and benefits of smart grid investments. Behavior change needs to be aligned to consumers live style priorities. It should make them feel good about what they are doing. Values are connected to emotion and behavior. Talk to people in terms of these values they will have more power. Values messages could include: don’t waste, be frugal, stay safe, political identity – no foreign oil. A direct “Green” messaging is not a strong source of value change. Influencers affect what people do. Family members and trusted media personalities trigger change. To instigate change, find the influencers that matter to people and influence them. Community is the best target for change. Seeing people from my reference community change encourages individual change. Apples to apples comparative information within a neighborhood or area results in energetic competition to reduce energy use. Change in groups feels like significant impact – and competition can motivate. Known communities support new behaviors and create communal experience. Find the Hub of change: People and influencers belong to communities. Key finding #1: "While consumers regard their utilities as the primary provider for energy-related products and services, dynamic business models are emerging." Specifically, Guthridge told us, while utilities are still the default incumbent, "one quarter of customers (indicated they) would buy their simple electric service from someone other than their utility," if given the option. 73 percent of consumers surveyed indicated they would consider buying in-home products and services from non-traditional providers. Key finding #2: "Price is the pivotal factor in the acceptance of electricity management programs, but price alone will not drive adoption." While 83 percent of the global population in the survey said the No. 1 impact for them was the cost the new service would add to their utility bills, 73 percent indicated that a utility loyalty program also ranked very high in perceived value. Last year's North American research clearly pointed to a focus on in-home displays as a high value-add, but Guthridge said this year the trend is moving to more set-it-and-forget-it convenience. There's a gender difference here, as well. "Men tend to focus on technology channels, while women are more focused on solutions that are intuitive and easy to use across the family." Key finding #3: "A wide array of consumer preferences is driving the need for differentiated propositions and experiences." For utilities, this means "you can't have a single program or a single pricing structure that will appeal to the whole breadth and depth of residential customers, especially in the U.S.," Guthridge said. Additionally, "more than 60 percent of the customer base does not really want heavy, hands-on management of their energy savings...Tailoring the programs, products and channels to match the (customer) segments is most important." Key finding #4: "Consumers will respond to programs that consider their full spectrum of values and preferences." They want programs that are easy to use, simple and convenient, and with some "uniqueness" or customization to fit their own personal needs. A 2010 national survey by Market Strategies International shows that the U.S. Electric Industry faces an interesting challenge – more than three-quarters of Americans do not recognize or understand the industry’s best available technologies to improve energy efficiency, reduce energy costs and curb global warming – the smart grid and smart meters. Seventy-nine percent of Americans claim to know little or nothing about the smart grid, while 76 percent lack knowledge or understanding of smart meters However, the study also shows that Americans are very supportive once the technologies have been explained to them. 75 percent feel implementing Smart Grid/Smart Meters should be a priority over the next 1-5 years. 67 percent support their utilities implementing these technologies (when costs to consumers are estimated at $6-$10 per month). To underscore the support, the results vary only slightly at lower or higher monthly cost estimates. Make smart choices based on better information alone results in 5% - 15% savings seen in studies. Average US electric bill is about $1200 per year so the savings are about $120 per household. With about 100 million US households this equates to $12 billion per year. Market Size - Green True Believers represent the smallest percentage of total consumer market. For example, only early adopters care about a Carbon Calculator. Mainstream people have little interest in any of this stuff. According to the 2009 Green Power Progress Survey released in August, $48 is the average price American will pay in a one-time fee for installation of hardware to facilitate the "benefits of smart grid technology" And out of the respondents that yielded that average, a quarter weren't willing to pay anything at all, another quarter weren't willing to pay more than $25, and only 7 percent would pay more than $100. The survey found there is another category of "green elites," or people who said they are involved in sustainability or environmental efforts, willing to pay about $70 on average, with 14 percent of them willing to pay $100 or more. Immateriality of Savings - The few dollars per month that consumers get for letting the utility control their lights, refrigerator, AC, etc. are miniscule compared to my original justification for purchasing that appliance. They don't want the complexity added to my life. A 2011 Accenture study found the modest savings from active energy management in a home—doesn't necessarily motivate persistent behavior. But price incentives bundled with other offerings can motivate persistent behavioral changes, Accenture found. Rewards programs used in other industries, for example, may work for utilities. Convenience, loyalty points, a technology or some other variable must be combined with price to find the right combination to drive higher levels of adoption upfront and over time. Short Term Cost vs. Longer Term Benefit - A 2011 consumer survey by Harris Interactive found There is little understanding of the longer-term benefits in energy cost savings, many of which can exceed the initial higher cost of the equipment investment in less than a year (which translates to an ROI greater than 100%.) The biggest obstacle to widespread consumer, industrial and commercial adoption of energy efficient technologies remains the up-front sticker shock. 34% of US respondents to the Harris survey said they would make more room in their budget for energy efficiency efforts. On the other hand, a significant two-thirds said they were willing to make behavioral changes like using their energy-intensive devices at different times to conserve energy. Carry-Over Perceptions - Consumers remain unconvinced of the value of energy efficiency, in part due to skewed perceptions of its true cost. For example, the general public believes that an energy-efficient building has an upfront cost premium of nearly 20%, while the actual premium is a mere 0% to 3% on average. Consumers equate energy efficiency with sacrificing choice, function, comfort, convenience, and aesthetics. Efficiency still bears a stigma from flawed, first-generation versions of products like compact fluorescent light bulbs (CFLs) and electronic ballasts. Despite subsequent technology advances, many skeptics still associate saving energy with the reduced function and high initial cost of those early devices. Entitlement - Smart grid, in order to return the benefits of the business case must overcome this societal concept that electricity is a right. To just assume that people will buy into the concept because it is "good for society" is naive and dangerous. Fear of Big Brother - Auto correct can be annoying to some. A Prius Display provides real time feedback on gas mileage to help drivers modulate the way they. Some people like it, but others hate it because they don’t like to be hectored by car. Privacy – Consumers don’t want an intrusive system. Hassle– Competing for scarce consumer attention and time.. People will only do optional things if it is easy and fits with life There is a 40% churn rate on twitter, participation needs to be encouraged over time. Ignorance - It is still unclear what percentage of the public is aware of the Smart Grid. It is clear that consumer awareness will be needed for adoption of the program and supporting the ultimate goal of energy conservation. Early adopters are technology enthusiasts looking for a radical shift, where the early majority simply seeks productivity improvement. Early adopters hope to get a jump on competition, lower their costs, get to market faster, have more complete customer service or get some other similar business advantage. Those in the majority of the market, however, want to minimize discontinuity. They want evolution, not revolution. They want technology to enhance, not overthrow, established ways of doing business. And they don’t want to debug someone’s product—they want it to work properly and to integrate with existing technology. Everyone wants to be a big fish, but not in a small pond – Being a market leader is every company’s objective. But no company wants to be known of as king of a small hill. Even though conquering successive small hills leads to mountains. Not all features and benefits may be required – For companies that have invested time and money developing a deep product, focusing on just one small niche and a subset of their features can feel insulting to engineering. Crossing the chasm means making decisions that are best for a narrowly defined customer, not for your product’s bragging rights. Education - Chances are consumers would be more accepting and possibly even demand updated power systems if they actually knew about the Smart Grid and how it will benefit them. Consumer benefits need to be defined and advocated by utilities and policymakers alike across all economic levels. Education should include a Call to Action; people need to know what they need to do. Feedback on the impact of customer participation in the smart grid will be necessary to allow and improve coordination between the utility and its customers, to minimize customer disruptions, and improve customer service. Visibility - Put feedback “in my face” People need to see their impact at the point of use. There seems to be promise in putting easy-to-digest information "tidbits" based on their personal smart grid data in people's hands when we already have their attention, for example when they login to bill pay. This is where we find the masses instead of the excel-loving-green-early-adopters. There may be potential for simple messages that speak to the customers' bottom line -- for example when they login to pay their power bill, to see "You spent $25.00 more this month than last month, and you could save $x.00 by turning off your printer each night" seems to have potential to inform and to motivate behavior change. Community - A program of telling homeowners how their electricity use compared with their neighbors' had the effect of cutting energy consumption by 2%, the same as the impact of an 11% to 20% rate hike, says Hunt Allcott of MIT. The research shows that interventions not based on electricity prices can substantially and cheaply change consumer behavior. Excitement - Make Home Control Fun To get beyond the early adopters—who are primarily concerned with functionality—offer a fun and easy user experience, from purchase through installation and use. Energy efficiency measures should provide enjoyment to those who implement them and for everyone who encounters them. Interactive websites, such as energy use dashboards for the home, can provide visual, real-time feedback to help users understand and make better choices about their energy consumption decisions. Ease of Use - Minimize Behavioral Changes By their nature, many products and services within the family ecosystem are complex, requiring that users learn new behaviors. Consumers have difficulty evaluating the efficacy of investing time/effort in learning new routines. To militate against consumer inertia, companies should offer products that facilitate existing behaviors, helping consumers save time or effort. People don’t change default settings – default to conservation. When set appropriately, programmable thermostats provide a high degree of customization for region and season, save time and effort, and deliver a quick payback. Rate Design - Participation hinges on the accurate design of electricity rates that reflect appropriate economic realities. Consumers need much more access to an innovation called “smart pricing” — in other words, electricity prices that vary based on supply and demand — a key change the Smart Grid was designed to enable, and one that might make it a lot more worthwhile to pay attention to your energy behavior. Market Segmentation - Different Consumers want different things. A 2011 Accenture study identified six separate categories for residential customers. Energy efficiency solutions should fit with a customer’s location, situation, and socio-economic status. Each of these customer segments requires a completely different value proposition. Self-reliants: Prefer to manage electricity consumption on their own. Social independents: Enjoy testing new technologies. Cost-sensitives: Look above all for the best financial rewards. Service-centrics: Would like the best service for them and their family. Traditionalists: Prefer a familiar experience. Tech-savvys: Value convenience and efficiency. K.I.S.S. : A study of successful pilot programs in Illinois confirms that utilities struggle to communicate about the smart grid in simple and clear language. Jargon and unnecessary acronyms are rampant, and these ultimately breed confusion, suspicion and mistrust among consumers. Ontario-based Hydro One, by way of positive example, has done a strong job in using digital animation and Internet-based graphics to clearly illustrate how the smart gird works and what its benefits are. Leverage Power of Third Parties: According to the Accenture Study, consumers trust third parties more than utilities for information on optimizing electricity consumption. Often in this regard traditional adversaries can become cooperative partners. For example, the Natural Resources Council of Maine has supported smart meter installation in that state, lending a reasoned and credible voice to the debate over Central Maine Power’s smart meter roll-out. These kinds of groups should not be overlooked for collaborative educational outreach, if and when possible. Separate the Forest from the Trees: When it comes to the smart grid, it is vital that customers understand the big picture – the larger context of and justification for smart meter deployments. This is especially important because most of the long-term economic benefit of the smart grid could come not from reduced utility bills but from mitigated rate increases due to the inevitable, long-term rise in the costs of generation. Embracing New Media: Ultimately, endorsements from friends and peers are the most effective way to spur adaptation of the specter of technological change posed by the smart grid. Generally, utilities have been slow to employ the most powerful tool available today to achieve this: social media. Through a technology platform provided by Virginia-based OPower, utilities are engaging online communities of enthusiastic smart grid advocates through Facebook and Twitter ‒ who make up just five percent of their customer base ‒ to spur adaptation from the other 95 percent. Innovative utilities understand that social networks represent a powerful channel for in-depth engagement with residential users, and are embracing them. Aesthetics. Energy-efficient products should please the eye. For example, LED lamps look sleek and stylish, and flat-panel computer screens look streamlined and modern, with the added benefit of using less desk space. Emphasize Comfort, health, and safety. Energy-efficient solutions should address the well-being of consumers and their families. Daylight can reduce eyestrain, and greener buildings can offer better indoor air quality. Empowerment. Energy efficiency solutions should provide an array of choices that allow anyone to do something positive for the environment according to their level of commitment. Rebates and tax credits provide incentives for low-cost actions like weather-stripping on up to big-ticket items such as efficient furnaces and central air conditioning units. Productivity. Energy-efficient solutions should enhance working and academic environments. Efficient lighting and air conditioning can improve comfort and morale, leading to improved business output and sales, and better student performance. Status. Energy-efficient products should have a cachet that enhances a customer’s self-image, rather than seeming like a sacrifice. As with solar panels and hybrid vehicles, LED lighting shows promise of becoming a status symbol and a highly visible display of environmental commitment. C3 Energy, Redwood City - Develops and publishes energy software. The Company offers smart grid analytics to utilities to helm them manage their systems. C3 Energy provides utilities with end-to-end system visibility across supply-side and demand-side smart grid operations. In May 2012, C3, purchased Efficiency 2.0, a residential energy efficiency company that uses rewards to encourage people to save energy. For C3, which was founded by Siebel Systems’ Tom Siebel, the acquisition allows the company to bring more comprehensive offerings to utilities that want to tackle all of the customer classes. Efficiency 2.0, which is based in New York City, recently picked up Southern California Edison as a customer, and also counts ComEd, Northeast Utilities and Cambridge Energy Alliance as some of its clients. The appeal of Efficiency 2.0 is its low-cost solution compared to other hardware-intensive options. What Efficiency 2.0 does that no one else does is offering cash rewards for saving energy. The customers who just receive mailed reports save about 2.5 percent, while those that log into the web program to earn rewards save just over 6 percent. OPower - Arlington, VA - #Opower (on twitter) - The most prominent company in the field of consumer energy behavior modification. 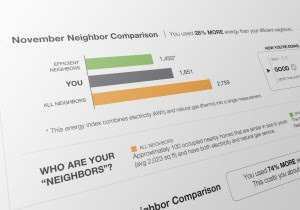 Opower compares your power consumption with the power consumption of similarly situated neighbors. It then puts a paper note bearing the results of the analysis inside your next utility bill. Opower has found that consumers who use more power than their neighbors will reduce their power consumption to hew more closely to the status quo. Here's a great statistic from the company: in 2010 the firm provided the equivalent of one-third of the U.S. solar industry's output in energy savings -- simply by sending out an actionable set of data once a month to utility customers. Opower’s business model has been successful because utilities send Opower’s detailed bills to its customers automatically (as an opt-out service), and the bills have a very high chance of being opened because the envelope looks like their standard utility bill. Opower has evolved a lot over the years. The software provider started with a simple efficiency solution for utilities, and has since deepened its analytics and moved into demand response, billing, segmentation and customer care. Opower finished 2014 with $128.4 million in revenue, a 45 percent increase over 2013. The utility-consumer behavior expert posted a GAAP net loss of $41.8 million in 2014. For years, Opower has helped utilities tackle easy-to-fix energy-efficiency problems and improve basic customer offerings. But now, many utilities are thinking about more sophisticated segmentation and increased customer satisfaction. In most cases, utilities lag behind other industries in the evolution of customer services. In April 2012, Opower and Facebook unveiled their first social energy application, the results of six months of development aimed at making household energy efficiency as cool as Words With Friends. Opower’s app also draws from the reams of data that the Arlington, Va.-based startup has collected from the 70 or so utilities it now serves, which collectively have about 60 million customers. That means Facebook users can see how efficient they are compared to others that share similar living space in terms of square footage, climate zone and type of heating and air conditioning, for example. People Power - Palo Alto, CA - Founded in 2009, provides energy consumption monitoring solutions. The company offers carbon emissions reduction and energy efficiency solutions. SmartEnergy IP - Philadelphia - Provides strategic communications, strategy and solutions for utilities across the world. From the development of specialized customer education programs to the implementation of those programs, SmartEnergy IP™ provides a wealth of knowledge and experience to improve the customer experience. 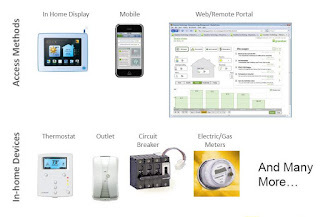 In Jan 2014 has launched what it is calling the "first-ever" Smart Grid Customer Education Model, providing a common framework for utilities to educate customers on the benefits of smart grid and encouraging close collaboration and communication between IT, metering, and marketing departments within utilities. CIEE - California Institute for Energy & Environment - UC Berkeley, - Behavior & Decision Making - The potential for saving energy in California is huge. But getting people and organizations to do things differently is a tricky proposition. Energy efficiency isn’t just about new technology, it’s about new behaviors and better decisions. Understanding how we think — and what motivates us to action — is the catalyst of change toward a sensible, sustainable energy future. Smart Grid Consumer Coalition - A new nonprofit coalition of utilities, academics, smart grid companies and consumer advocates that is hoping to find out what the customer knows and wants when it comes to a 21st-century electrical grid, and how players can deliver their messages so consumers will listen and learn. Current members include Future of Privacy Forum, IBM, Control4, Silver Spring, GE, NREL and various utilities. The organization will share best practices amongst members as they are developed.